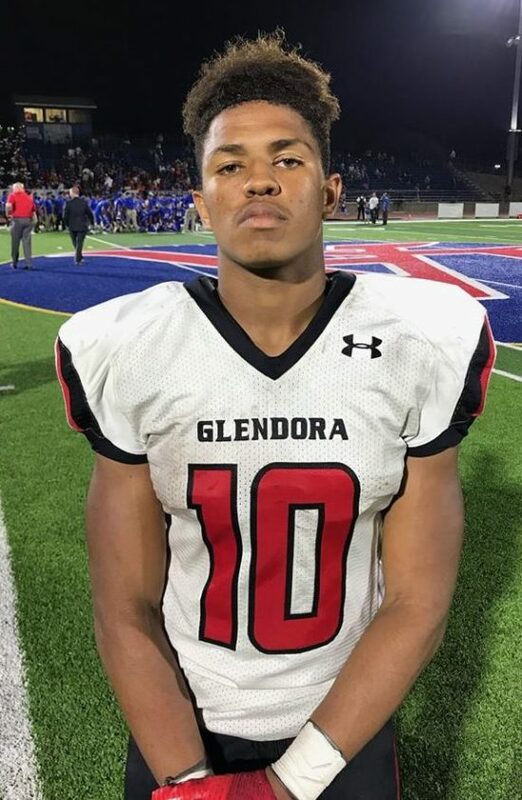 (Hacienda Heights) — Glendora running Xzavier Ford tallied 167 rushing yards and scored three touchdowns in the Tartans 24-10 win over Los Altos Friday night at Patrick J Mauch Memorial Stadium. Early turnovers halted the Tartans to get any points in the first quarter. The offense had to wait until the middle of the second to get the games first points. With a chance to get the game’s first touchdown, Cade Marshman dropped Jacob Gonzalez’s pass in the corner of the end zone. Glendora settled for a Jake Peralta 32-yard field goal with 6:47 in the second quarter. Sixteen seconds later, David Hacegaba hooked up with Zedekiah Rodriguez on the receiver screen and he took all the way to the house for the 80-yard touchdown. The Lead didn’t last very long on the ensuing drive for Tartans. On fourth and short and elected to punt, Shane Nutter faked the kick and bolted for the first down and converted. On the next play, Gonzalez found Dylan Hill deep for a 40-yard gain to put the offense at the one-yard line. Ford then capped the drive with his second touchdown of the night with one second left in the second quarter. Following intermission, Glendora kept the offense going when they handed the ball to Ford, who spun out of two Los Altos defenders and raced to the end zone for the 75-yard score bolstering the lead to 17-7 19 seconds into the third quarter. The Conquers had no answer throughout the third quarter. On their possession, they were forced to punt and on the following two possessions, the team fumbled the ball and both times were recovered by the Tartans. Los Altos did make some noise when Hacegaba took it upon himself and complete a 12-play drive when he scrambled his way into for a touchdown to bring his team within three points early in the fourth quarter. However, the Tartans didn’t take long to swing back. After Gonzalez connected with Marshman for a 66-yard gain, Ford put the game away when he bulldozed his way to pay dirt, sealing the game midway through the fourth quarter. 16 Comments to "The X-Man Conquers Los Altos"
The parents come along with the LA ship, this is what Brown asked for when he signed on. He actually hasn’t gotten it bad yet, just wait. Lol. And you may be young but you’re loaded with talent! Have dudes everywhere young or not they’re studs, so enough with the young stuff. Get Over It I was replying to LA HOMER. LA HOMER was saying player at LA made Spathais a better coach. So i replied Ziola and his staff coached at Diamond Bar and they went 0-10 one season after he stepped down. So can LA HOMER say player at LA made Ziola and his staff better coaches? Yes have your parents get on board with coach they thought would be better then last season. I’m just replying to LA HOMER this site is ok to say my opinion? Or my thoughts right Mr Peterson? Ziola hasn’t been a HC for 2 years now, so what does he have to with anything? Why bring him into this? Lets just get on board with Coach Brown, be supportive, and good things will come. Please remember that there only 8 seniors starting out of 22 positions on this year’s LA squad. LA is very young at some key positions, but they are definitely competing at a high level against some solid teams. Keep working Conqs! I’m a longtime area alum, parent, coach and now a current fan. As I look into some of the recent success of our area teams, I can’t help but gravitate to one division in specific: The Southern Section’s Division 5. From the surrounding area there are teams such as Glendora, Los Altos, St Paul, La Serna, Colony, Diamond Ranch, Los Osos, Corona, Burbank. While this division isn’t the powerhouse group like the Mater Deis, Amats, OLus, etc, it is a competitive group. Especially since a few of these teams have already met up against one another. Does anyone have any thoughts of how this may play out? If that was the case and last years team sucked so bad how come you’ve only beat Wilson? Zaldivar is still there. Rene is an awesome player, but to say he was the best on last years team is a far reach. They had a much better season last year. The LA team is running wild over here, players are undisciplined. To all the parents that are saying LA is one big happy family it is probably best to put the truth out there. LA is suffering from Daddy ball syndrome. @LA Homer, this years team is much much more talented than last years not to mention 20plus transfers. Last year their best player by far was a Zaldivar and he was only a soph. LA still as delusional as ever. So Spat goes to D13 an he is 1-3 at Workman? Seems to me LA made him look good with the players he had not his coaching. Spathais was 3-1 after 4 games. Dropping the 🎤I’m out!!!!! Lets start the fire Coach Brown campaign.